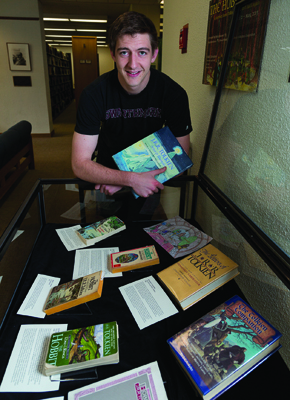 This spring, honors history and German studies major Ben Goossen ’13 became the unprecedented four-time winner of the coveted annual A. Edward Newton Award for a student book collection. His varied editions of The Hobbit—including some in foreign languages—were displayed in McCabe Library throughout the semester. 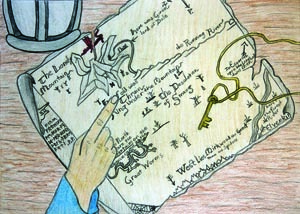 One of the exhibited items is an artist’s book in the making—a series of Goossen’s own colored full-page drawings, each illustrating the events of a chapter of The Hobbit. The book had become Goossen’s favorite as a young child during cozy hours spent by the fire while his father read The Hobbit and The Lord of the Rings trilogy. Goossen, who keeps the style of his early drawings for the sake of consistency, also wants his edition to look as authentic as possible. So, during a semester in Germany last year, he took a break, heading south to Morocco, where one of the leather workers for which that country is famous, made him a cover of soft, red leather, sporting the title embossed in gold. “It should have the look of the ‘Red Book’ in which Bilbo wrote down his tale,” Goossen says.